Democratic presidential candidate Elizabeth Warren, a self-described champion of the working-class, is firmly within the top 1 percent of economic earners, according to her 2018 tax return. 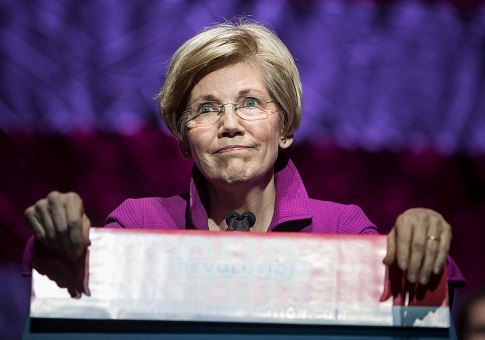 On Wednesday, Warren's presidential campaign released her most recent tax return showing the Massachusetts Democrat and her husband, Harvard Law School professor Bruce Mann, earned more than $900,000 in 2018. Warren, who previously released returns dating to her 2008 entry into political life, paid more than $206,000 in taxes in 2018 and had an outstanding balance of more than $24,000 to the Internal Revenue Service. The disclosure comes amid a renewed push by Democrats to obtain President Donald Trump's tax returns ahead of the 2020 presidential election. In the past, Warren has enthusiastically supported the effort by introducing legislation requiring presidential candidates, including current White House occupants, to release their tax returns. "There's a crisis of faith in government and that's because the American people think the government works for the wealthy and well-connected, not for them," Warren said in a statement Wednesday. "I've put out eleven years of my tax returns because no one should ever have to guess who their elected officials are working for. Doing this should be law." Warren's 2018 income is nearly double the threshold ($480,930) set by the IRS to denote individuals within the top 1 percent of the United States economy. A review of the senator's tax returns from the past decade show Warren and her husband have long belonged to the exclusive bracket. In 2008, the year Warren was appointed by then-Senate Majority Leader Harry Reid to oversee the federal government's stimulus program in the wake of global recession, Warren and her husband reported a total income of more than $831,000. The following year the couple's total income grew to more than $980,000, before decreasing slightly to more than $954,000 in 2010 when Warren was tapped by President Barack Obama to set up the Consumer Financial Protection Bureau. Warren's income decreased drastically between 2011 ($616,181) and 2012 ($424,993) while she was running for Senate in Massachusetts. Those trends, however, reversed upon her election. During her first year in the Congress, Warren's 2013 tax return indicates the couple made more than $1.07 million. Of that total, more than $585,000 was generated by Warren through the couple's "consulting, lecturing, writing, [and] investing" business. The return for that year shows that Mann only earned $498 for the business, on top of his $400,000 salary from Harvard Law. Warren and her husband's total income jumped to $1.67 million during her second year in the Senate. The increase did not result from Warren's new senatorial salary, but rather from her consulting and lecturing business. The couple's 2014 tax return shows that Warren pulled in more $1.18 million for the business, while her husband only generated $121. Warren continued to earn hundreds of thousands of dollars through the business through 2018 while she was running for reelection to the Senate and contemplating a presidential bid. The couple's total income ranged from $1.17 million (2015) to more than $972,000 (2017) and finally more than $905,000 last year. Although Warren and her husband consistently placed in the top 1 percent of earners, the couple opted out of voluntarily paying a higher tax rate in Massachusetts until 2017. The move saved the couple more than $50,000 over the last decade. Since announcing her presidential run, Warren has castigated the economic inequality plaguing working-class America. The senator has proposed a "wealth tax" on top earners to fund liberal programs like Medicare-for-All, universal childcare, and the Green New Deal, among others. This entry was posted in Politics and tagged 2020 Election, Democratic Party, Elizabeth Warren, Taxes. Bookmark the permalink.